Ha. The warp is ON. The way the back beam is set up makes it look pretty impressive. 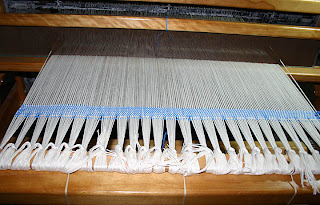 This is 8/4 cotton carpet warp, threaded 2 per dent/heddle. 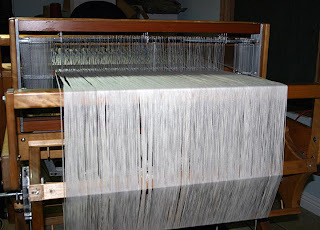 Tomorrow the wefting (weaving the pattern) begins. This is so impressive. 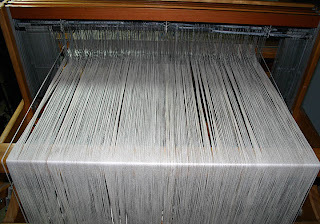 I am enjoying watching this process as I have been interested for years but never have had the opportunity to watch someone 'weave'. Thanks so much for sharing! I look forward to seeing it develop!